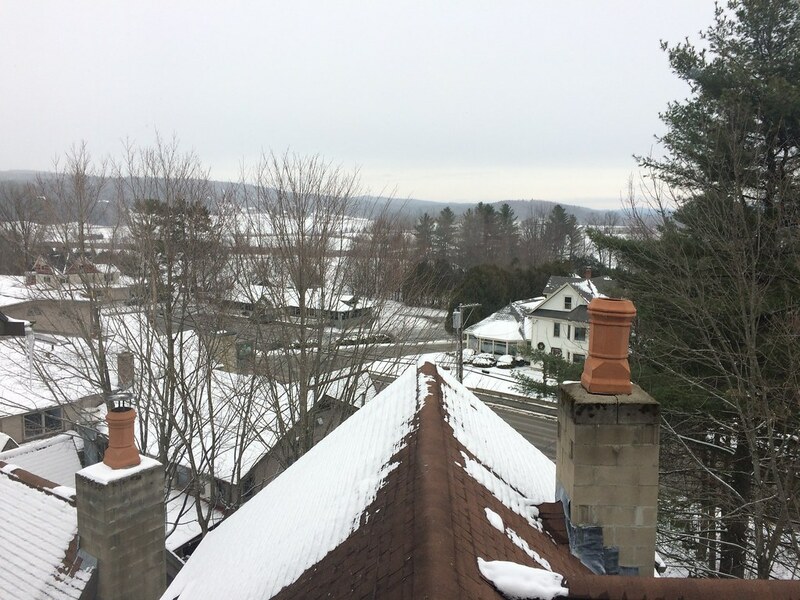 This Thanksgiving, I ended up in Vermont with the boyfriend for a little getaway. I've never traveled (other than to see family) on Thanksgiving and now that I have, I kinda love it. There's a bit of a thrill, feeling like you're skipping out on the obligation and only taking the rest, relaxation, and, of course, eating part. As you might expect, Stowe is an adorable little village, located at the base of a ski mountain. I don't ski, but I always dig on the vibe in a ski town. Everyone's on vacation, everyone enjoys being outside, and the aprés culture is my favorite part. We stayed at Field Guide, a boutique hotel managed by Lark Hotels, and I'm in love with every one of their properties. Field Guide is located on Mountain Road, on the way to the ski resort and is built into a hill. We stayed in a suite which was on the fourth floor by itself. Our room overlooked other parts of the inn, giving it a European village feel. 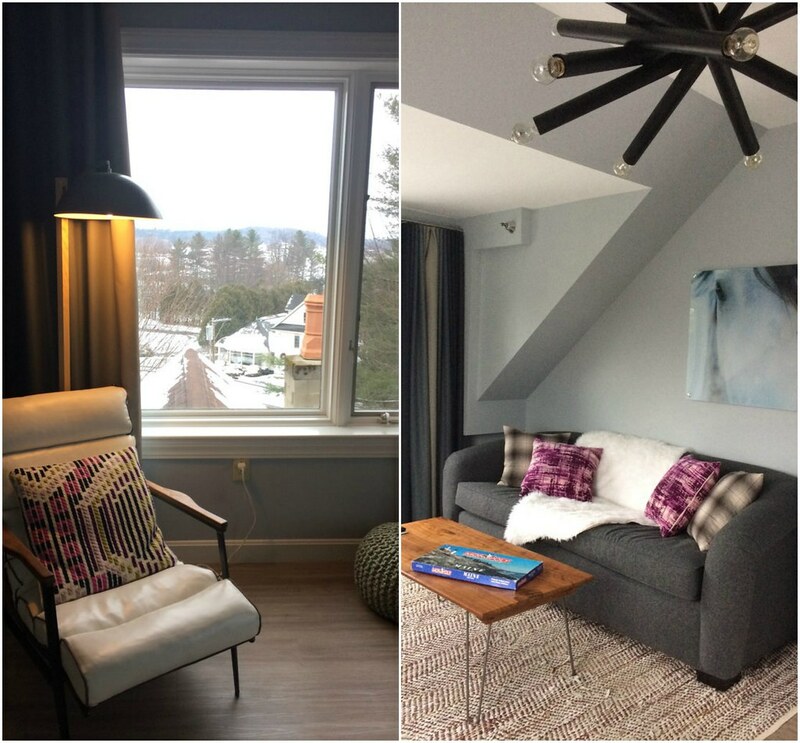 The Lark Suite is gorgeous, with modern and quirky touches in the living room, large bathroom with walk-in shower and soaking tub, and the bedroom with a king-size bed. 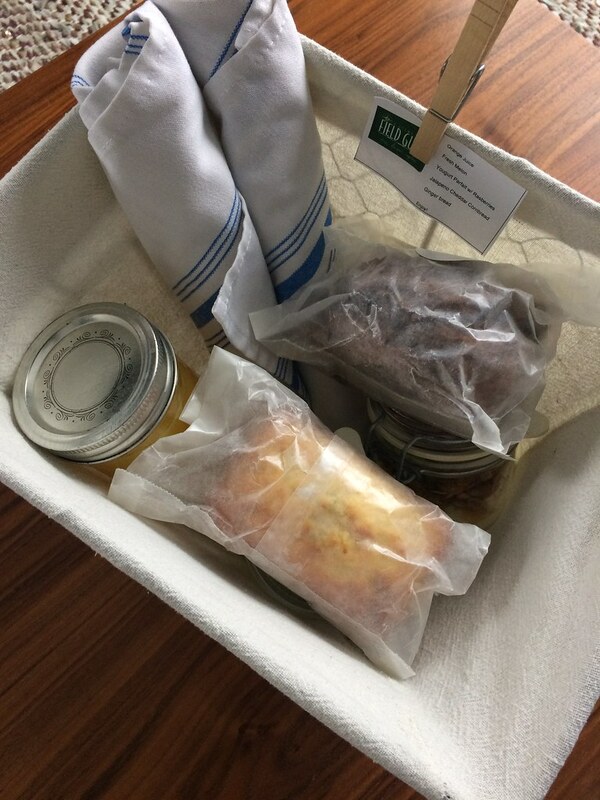 Breakfast at Field Guide is included with your stay and is delivered in a basket outside your door every morning. We enjoyed breakfast in bed—especially Thursday morning watching the Macy's parade with fresh coffee from our in-room Keurig (appropriate, since Keurig was invented in nearby Waterbury). Breakfast consisted of housemade baked goods like corn muffins and spiced gingerbread, muesli, fresh fruit, fresh-squeezed OJ, and yogurt parfaits. I'm definitely skeptical of hotel breakfasts, but every one that I've had at a Lark property has been delicious. But when we first arrived on Wednesday night, we had an urgent mission: beer. We arrived on the later side, but we figured we could max out our time and visit two places in the village. First up was Idletyme Brewing, just up the street from the hotel. The brewery has a full restaurant and bar and seemed on the fancier side as far as brewpubs go. 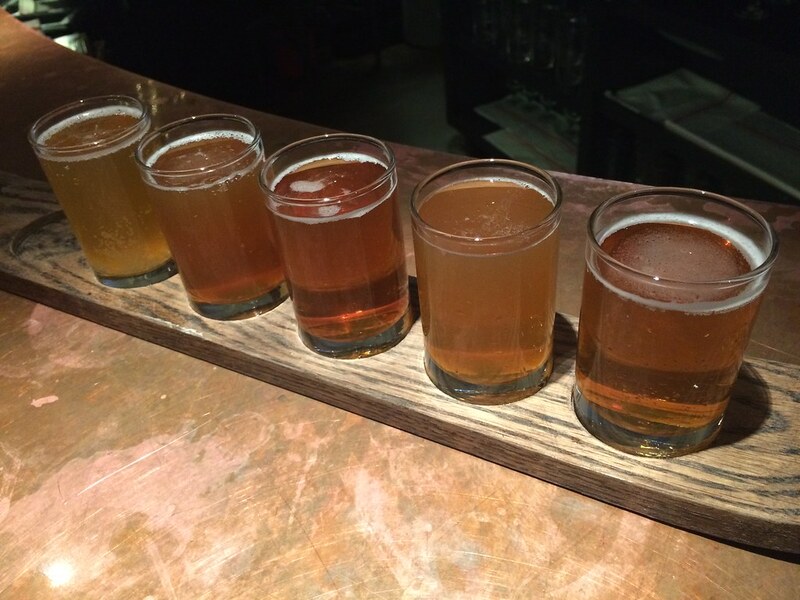 We sat at the bar and enjoyed a flight of 6 of the in-house brewed beers. While they had a large variety of lagers, we filled our paddle with ales—from the grapefruit pale ale to the Double IPA. I enjoyed being able to try similar styles side-by-side. 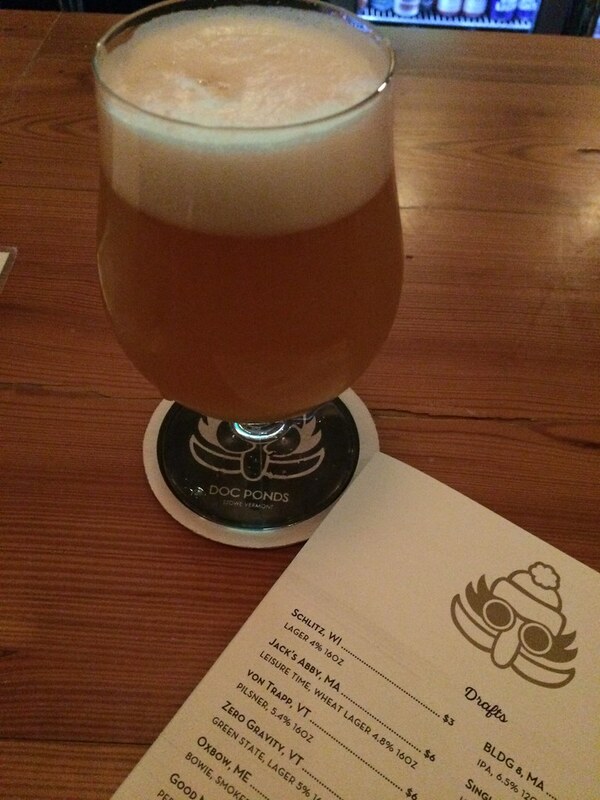 My favorite was the Idletyme DIPA. Next, we headed back down the Mountain Rd. to Doc Ponds, right across from Field Guide. I've heard a lot about the great beer selection at Doc Ponds and the food items sounded great too. By this time, the pre-Thanksgiving hometown crowd had started to thicken and the bar was nice and lively. Our bartender was very friendly and in talking to him, we learned that he had eloped in Portland—getting married on Peaks Island after taking a tour of Allagash Brewing with his fiancé. So he knew a lot of Maine breweries and helped us select some local brews. A. and I both ordered the Ebner, a double IPA, from Hill Farmstead on special that night for $4! After a round, we ordered their Doc Burger, a small burger on an impossibly soft bun and some duck fat fries. It was up there with some of the best food we had on the trip, but does much beat an amazing burger late night after a few beers? The next day, after that Macy's parade/breakfast in bed combo, we had grand plans to do some hiking, but forgot a few items that derailed our plans (namely: hiking boots). We also forgot our swimsuits for the hot tub, so we set off to a neighboring town's Walmart...in a snow storm. Yeah, shoulda stayed in bed with the parade, but that hot tub was calling! We still got our outdoor activity fix in by walking on Stowe's rec path, which despite that I might have scoffed at the idea of going on a walk on a rec path, was really lovely. The path meanders over creeks, through fields, and generally away from the rush of the busy road that it parallels. We joined lots of other families out for their pre-meal walk, throwing snowballs and generally enjoying the winter wonderland-ness of it all. After a walk through town and a dip in the hot tub, we were ready for our Thanksgiving Day dinner. I was happy that the hotel's restaurant stayed open on the holiday, ensuring that we wouldn't be forced into some elaborate prix fixe meal at a resort or hotel. 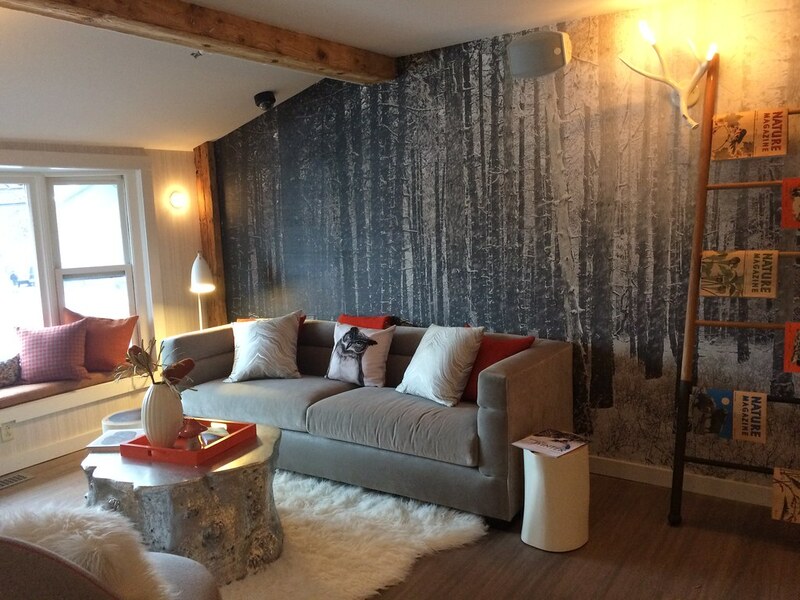 Like the rest of the hotel, the restaurant is cozy and decked out in a quirky mix of camp decor and modern furnishings. We sat at the bar and while the beer menu is full of local selections, I ordered a cocktail, the Pickwick Social (a nod to the name of the former bar in that space, Mr. Pickwick's), a mix of Barr Hill gin, Aperol, strawberry simple syrup, lemon, and egg white. I wanted to like it, but it had too much going on and never came together in a coherent flavor. A. 's Ginger Duke with Knob Creek bourbon, fresh ginger, cider, basil simple syrup was a much more successful combination. As was the spiced bar popcorn that came in a cute jar. The menu format is my ideal—small plates designed for sharing (I know, I know, eyeroll), but they were good-sized portions that did allow us to truly share without feeling like you need to restrain yourself to be polite. I ordered the creamy polenta, topped with mushrooms and a crispy egg that turned out to be a deep-fried, soft poached egg. Aren't you glad *that's* not your responsibility? Sounds hard to do. 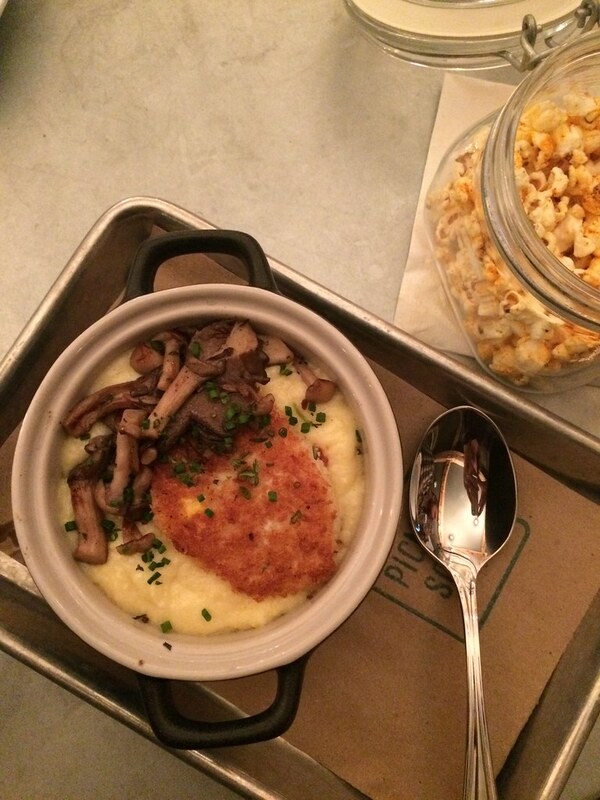 But egg-mushroom-polenta is a winning combination in my book. We also shared the spinach salad with warm bacon dressing (omg), the Brussel sprouts with apples and bacon, and the pot pie. 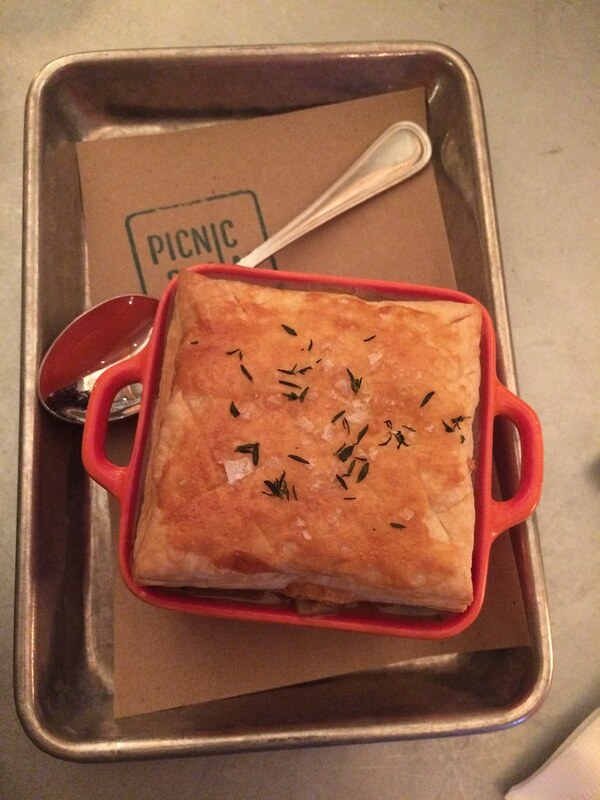 The pot pie had mushrooms and sweet potatoes, giving the classic dish a slight twist. For dessert, we enjoyed "pie in a jar" (apple on that day), but requested it to go to enjoy with Thursday night football in our room. For the win! We had to make our way back to Maine on Friday (sob), but we took the morning to visit the Alchemist and stock up on Focal Banger and Heady Topper. We also had one more meal in the area, so we stopped in neighboring Waterbury for lunch. 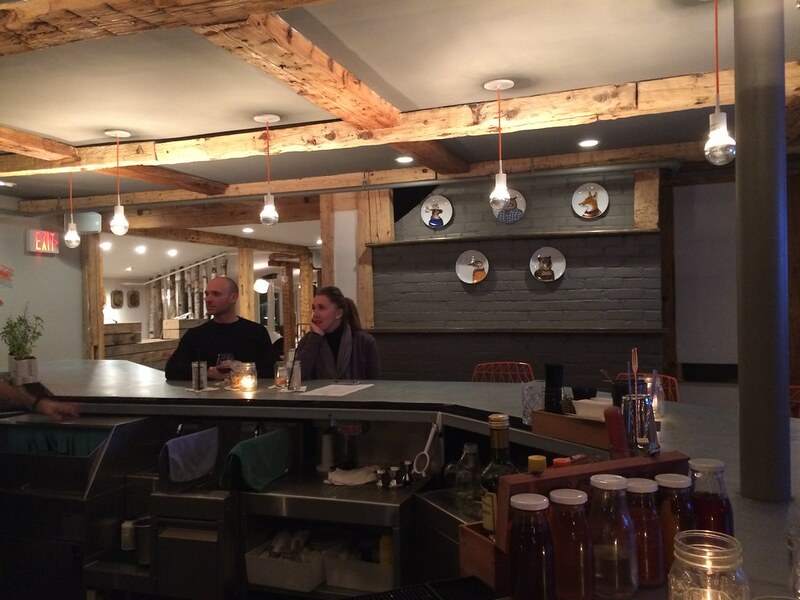 I wanted to visit Prohibition Pig, a brewpub with a focus on smoked meats and local beer. They have a huge draft selection of over 20 beers with near half of them made in-house. They also offer half pours of their beers, which I loved. I tried the Lawson's Finest Sip of Sunshine and A. got a different Hill Farmstead and a Pro Pig. 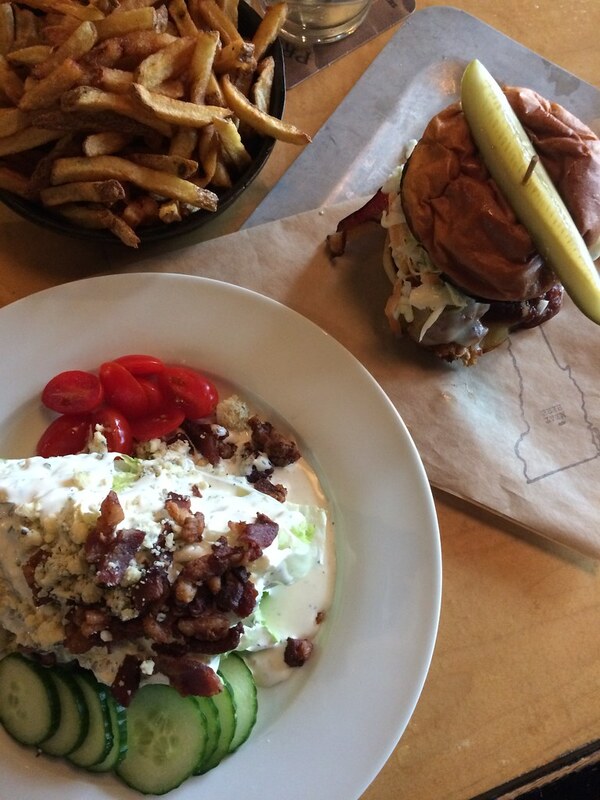 We shared the wedge salad, fries, and the special chicken sandwich with barbecue sauce, cole slaw, and cheese. SO GOOD. After that, we stopped by the Craft Beer Cellar to pick out some more Vermont beers—they sell single beers there, so I was able to buy some beers from Rock Art Brewery, 14th Star Brewing, Lost Nation and Lawson's to round out my haul. I love Stowe and can't wait to go back and explore more—there's tons of other restaurants and beer we didn't have time to try. If you're looking for a winter getaway, I recommend Field Guide as your home base!